Chizuru Kagura (神楽 ちづる) (whose real name is Chizuru Yata (八咫 ちづる)) is the younger of the two heiresses of the Yata clan, the other being her older twin sister Maki Kagura. She is a member of the clan that holds one of the three sacred artifacts that originally sealed the serpent monster Orochi 1,800 years ago. 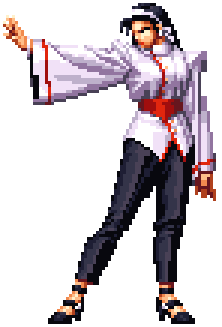 Chizuru made her character debut in The King of Fighters '96 as a mid-boss and the sponsor of the KoF tournament that year. Later, in The King of Fighters '97 she appeared as a normal participant in the year's Women Team. Like Kyo and Iori she is a member of one of the mighty clans that sealed Orochi with the help of the Yata no kagami or Yata Mirror. Due to the rivals' attribution towards one another, Chizuru is usually the one who has to keep the trio together. They form the Three Sacred Treasures Team whose endings often entail the canon events of any parties involved. As the heiress of the Yata, she was raised as a priestess and maintain the duty of keeping the diligent seal on Orochi intact. One night, Goenitz visited their home with intentions to destroy the seal. Maki confronts him, but since the power of their clan can not fight the Orochi without the help of the other two clans and Goenitz's strength as one of the Heavenly Kings was too great, she loses and is mortally wounded. Goenitz destroys the seal and leaves with the satisfaction of a weak but released Orochi. Before her death, Maki passes on the responsibilities of the seal to Chizuru, begging her to join the three clans together once again to defeat Orochi. Ten years afterwards, Chizuru has become a very successful and prestigious business woman under the family name Kagura. She secretly kept track with the King of Fighters tournament since it began with Geese Howard and hosts the tournament in 1996 in hopes of entreating Kyo Kusanagi and Iori Yagami to help her replace the broken seal. Though both Kyo and Iori protest, the three of them succeed in their task at the climax of The King of Fighters '97. She fights with the power of illusions, often using them to project duplicates of herself to attack from a distance or to travel herself across the screen. She also has the power to seal her opponent's moveset for a time. Her moves were very powerful when first introduced -often replicating several copies of herself at once- but was toned down in her later appearances. This page was last edited on 18 January 2009, at 11:46. This page has been accessed 9,277 times.